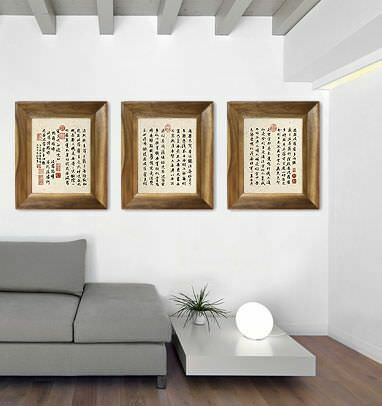 This is for a 3-piece set of ready-to-frame Giclée prints of the famous Heart Sutra. The version here was originally written by Zhào Mèngfǔ (趙孟頫) during the Yuan Dynasty. He lived from 1254–1322 AD. This was probably written in the early 1300s. The original is in rough shape with stains, tears, and a few missing bits. Also, it's in a museum and considered a priceless artifact. Another calligraphy expert and I spent about 20 hours digitally restoring a high-resolution image so that we could a set of prints that is faithful to the original, yet can be easily framed and displayed in your home or meditation room today. You will receive a set of 3 unique prints (because the paper is handmade, each one is one-of-a-kind) and all you will need to do is pick out 3 standard picture frames at your local store (such as Michaels). I suggest a rustic wood frame to match the feel of these. Be sure to hang them on your wall in the same orientation that I show on this page. The Heart Sutra is read vertically in columns that start on the right and proceed to the left.